NEW YORK, Dec. 16 /CSRwire/ - Acumen and Unilever announced today they will invest nearly $800,000 to enable BURN Manufacturing to bring its new low-cost, energy-efficient, wood-burning cook stove, the Kuniokoa™, to smallholder and plantation workers in tea estates in Kenya and Tanzania. This is the first investment of the Enhancing Livelihoods Investment Initiative (ELII), a partnership between Unilever, Acumen and the Clinton Giustra Enterprise Partnership (CGEP) that aims to improve the livelihoods of smallholder farmers and their communities in Africa, South Asia, Latin America, and the Caribbean. The investment will allow BURN Manufacturing to provide cleaner and more efficient wood-burning stoves to rural communities. The project will initially focus on Kenya and work with Unilever and its supply chain partners to identify and support smallholder and plantation workers in Unilever tea estates. More than 2.6 billion people around the globe do not have access to clean cooking facilities to meet their daily needs. Ninety percent of smallholder famers cook in open wood-burning fires (e.g. the “three-stone fire”), leading to serious health and environmental problems. Farmers can spend five to ten hours per week collecting firewood and up to a third of their income purchasing fuel. 50 percent of the destruction of Africa's forests is due to collection of firewood or wood for charcoal production. Efficiently designed cook stoves require up to 60 percent less fuel and emit less CO2 into the air. BURN’s collaboration with the ELII partnership aims to improve health and wellbeing of smallholder farmers by providing a wood-burning cook stove that is both clean and affordable. Acumen previously invested in BURN in February 2015 to support the expansion of its production of charcoal-burning cook stoves. BURN now has sales of more than 10,000 stoves per month, making the company’s current Jikokoa™ cook stove the top selling cook stove in Kenya. The Jikokoa reduces fuel consumption by 56 percent, fuel costs by $100-200/year and emissions by 60 to 65 percent, making it the first commercially successful “Tier 4” cook stove project in the world. These stoves will also help combat deforestation and pave the way for further innovations in fuel efficiency for low-income communities. In February 2015, Unilever, Acumen, and CGEP launched the Enhancing Livelihoods Investment Initiative (ELII) with a three-year, minimum commitment of USD $10M to improve as many as 300,000 smallholder farmers and their communities in Africa, South Asia, Latin America, and the Caribbean. ELII seeks to catalyze economic growth and alleviate poverty amongst low-income communities in the developing world, while creating more inclusive and sustainable value chains. The program’s objective is to dramatically increase the depth and breadth of positive social impacts on livelihoods of low-income communities by scaling sustainable businesses and linking agricultural enterprises to global supply chains. Acumen is changing the way the world tackles poverty by investing in companies, leaders and ideas. We invest patient capital in businesses whose products and services are enabling the poor to transform their lives. Founded by Jacqueline Novogratz in 2001, Acumen has invested more than $88 million in 82 companies across Africa, Latin America and South Asia. We are also developing a global community of emerging leaders with the knowledge, skills and determination to create a more inclusive world. This year, Acumen was named one of Fast Company’s Top 10 Most Innovative Not-for-Profit Companies. Learn more at http://www.acumen.org and on Twitter @Acumen. Unilever was ranked number one in its sector in the 2015 Dow Jones Sustainability Index. In the FTSE4Good Index, it achieved the highest environmental score of 5. It led the list of Global Corporate Sustainability Leaders in the 2015 GlobeScan/SustainAbility annual survey for the fifth year running, and in 2015 was ranked the most sustainable food and beverage company in Oxfam’s Behind the Brands Scorecard. Unilever has been named in LinkedIn’s Top 3 most sought-after employers across all sectors. 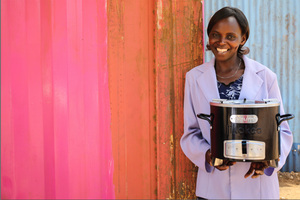 BURN designs and manufactures cook stoves in order to save lives and forests in the developing world. Under the leadership of Peter Scott, BURN is a leader in the cook stove industry and was named one of Foreign Policy Magazine’s Top 100 Global Thinkers in 2010, the company has grown to become the leading clean cook stove manufacturing and distributing company in Kenya. BURN has established sub-Saharan Africa’s first and only modern cook stove manufacturing facility, employing more than 100 Kenyans, to produce its stoves locally in Nairobi and catalyze Kenya’s economy. In addition to Acumen’s investment, BURN is the first cook stove company to receive investments from Acumen, the United States government’s Overseas Private Investment Corporation (OPIC) and General Electric (GE). BURN conducts R&D from its and headquarters in Washington State and conducts manufacturing sales and marketing in Kenya and East Africa. Learn more at www.burnstoves.com.